A solar powered lighting system is a cost-effective solution to light up a camp, shed, or small home. 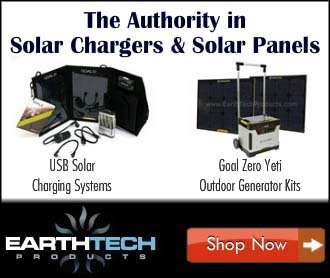 If you are off the grid and need basic solar powered lighting, then these kits may be a great option. They are easy to setup and self-contained. They come complete with LED bulbs, solar panels, lithium battery and cables. These solar panel lighting systems are very mobile and are easy to move from one location to another. You can also charge a phone using a USB cable. Solar powered light systems come in various sizes and watt capacity. Let’s look at some. The HKYH Solar Panel Lighting Kit is larger solar panel lighting system. It comes with three 30 watt foldable solar panels, 4 LED lights, cables and 5 volt DC converter with battery. This system will provide about 10-12 hours of light before recharging. Setup is quite easy, the solar panels come with brackets and screws to mount them. The inverter box has a simple input on the back to plug in the solar panels. Five USB outputs on the front for the USB lights and USB charge cable. Each light has an independent switch to shut off the light. There are a meter and lights on the inverter battery box that will indicate proper charge and voltage. It will also provide you with the health and charge of the battery. These kits come in smaller sizes. Good overall solar panel light kit for remote locations or emergency lighting. The LightMe Portable 15W Solar Powered LED Light Bulb is a single light solar powered lighting system. It can be useful for small areas or emergency lighting. It consists of one LED light, solar panel and cable. The LED bulb is comparable to a 15W incandescent lamp and will give off 5 hours of light when fully charged. The MicroSolar 42 LED Outdoor Solar Powered Floodlight is a very bright solar powered light system. It consists of 42 LED’s and outputs 180 lumens of light. This solar light will work for about 8 to 10 hours before a recharge is needed. It has a 3W solar panel which includes a lithium battery to hold your stored energy. This solar lighting system is excellent for illuminating large areas. This light has a dusk till dawn sensor which will provide light throughout the night. Great solar light system for outdoor areas with limited visibility. All of these solar panel lighting system can illuminate areas for hours on end before having to be recharged. They are a convenient way to have lighting, if electricity is not available. These lighting systems are very portable, making them great if you are on the move.